The Lay-Z-Spa Range - What are the Differences? The Lay-Z-Spa Range – What are the Differences? Having your own personal spa is a dream for many people. The relaxation, the bubbles, the warm water: What’s not to love? Well, for many people, the answer is simple: The price. Installing a spa can prove to be an expensive, time-consuming process. And it isn’t just buying the spa that costs so much. There’s the shipping, pouring the concrete base, installing it. Isn’t there a cheaper option? Yes! For many people, these hassles can be overcome by investing in an inflatable spa! These spas, which offer all the perks of a traditional tub, cost only a fraction of the price. Not only that, but the shipping is far less expensive, and you set it up yourself, so there isn’t any middle-man to pay. Filling it with your garden hose only adds to the convenience, so that there isn’t any plumbing work necessary to enjoy your new inflatable tub. 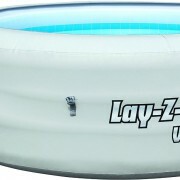 Lay-Z-Spa is a great choice when considering an inflatable hot tub purchase. A huge part of the inflatable hot tub industry, and highly respectable, this company has been one of the United Kingdom’s favorite inflatable spa manufacturers. They offer a wide variety of options, from frugal to luxurious, basic to exceptional and everything in between. But, with so many inflatable spas on the market, how do you know which one is the best for you? Simply look at the similarities and differences of those listed below, and you’ll find the spa that is perfect for you! 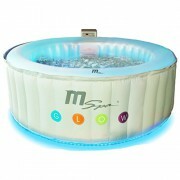 While the Lay-Z-Spa Paris is on the expensive end at approximately £599, this product is most certainly worth it! Easy to set up (takes only ten minutes to complete), this tub boasts an AirJet Massage System. This allows 87 AirJets to produce all of the soothing bubbles that you might desire. Lay-Z-Spa Paris will also heat up to a stress-melting 40 degrees Celcius, and will do so quickly enough that you’ll be enjoying your nice, warm spa in no time. Want a bit more atmosphere out of your spa? Then use the wireless remote to change the LED lighting that comes with it! This spa is made to hold approximately four to six people, making it a good choice for those who prefer their soaks to be more private. Click here to read our full comprehensive view of the Paris model. Are you looking for a starter tub kit that you can get right to using straight out of the box? Then look no further than the Lay-Z-Spa Vegas! This portable tub is a more affordable option than the Paris, with the average price being £499. The Lay-Z-Spa Vegas, while less expensive, usually comes with the equipment needed to maintain it: Two filter cartridges, a chemical floater, a maintenance guide, and a setup DVD. Because of all of the added equipment, this is one of the best options for those who want a spa with no guesswork. Beyond the valuable extras provided, this inflatable tub also has a Lay-Z-Massage Jet System, which produced relaxing, nerve-soothing jets. Able to heat up to 40 degrees Celsius, the warmth will only had to the pleasure. The Lay-Z-Ma Vegas can fit four to six people. Click here to read our full comprehensive view of the Vegas model. Are you looking for an inflatable spa for your own use, instead of for a larger group? Or perhaps you’re looking for an affordable option in the inflatable spa market? Either way, look no further than the Lay-Z-Spa Miami! This spa is a great bargain with an average price of just £399. The Lay-Z-Spa Miami is perfect for relaxing, and comes with a Lay-Z-Massage Jet System, which will help soothe muscles and nerves after a long day. This tub will also heat water up to a stress-melting 40 degrees Celsius adding to the relaxation. Because this spa also comes with materials needed to set up and maintain it (including two filter cartridges, a chemical floater, a maintenance guide, and a set up DVD), this makes for a particularly good spa for those who don’t know a lot about maintaining one. Sits between two and four people. Click here to read our full comprehensive view of the Miami model. The Lay-Z-Spa Palm Springs is another great choice for someone looking for an affordable spa. This spa, which can sit between four and six people, costs an average of just £399. Because it is affordable, and can readily fit so many people this spa is a great choice for those who like to entertain guests with a warm, bubbly soak. The Lay-Z-Spa Palm Springs comes with a Lay-Z-Massage System that boasts 120 air jets, allowing for the maximum amount of bubbles in your hot tub. This spa is also capable of heating water up to a relaxing 40 degrees Celsius, helping to melt away the day’s stress. This spa has a few other unique features, as well. For one, it has a three-layer, rigid body, so that it will maintain its shape and offer support to those that use it. It also comes with a quick cover, so that you can keep debris and insects out of your water in between soaks. Click here to read our full comprehensive view of the Palm Springs model. 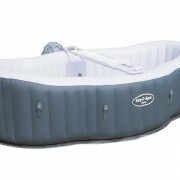 Are you looking for something a bit more luxurious from your inflatable spa? 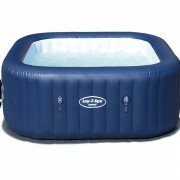 Or maybe you like to hold get togethers, and think that an inflatable hot tub would be a good choice for the next one? Either way, you’ll want the Lay-Z-Spa Monaco. This spa is at the more expensive end of the spectrum, costing on average £699. But it also has some of the best features. 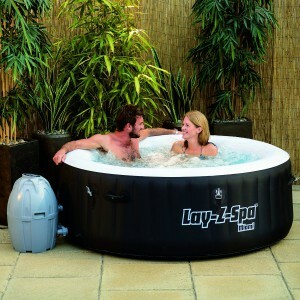 The Lay-Z-Spa Monaco has a high capacity, seating between six and eight people comfortably. This makes it a perfect option for groups. 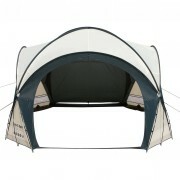 It also comes with a Lay-Z-Massage Jet System to provide the most comfortable and soothing experience possible. 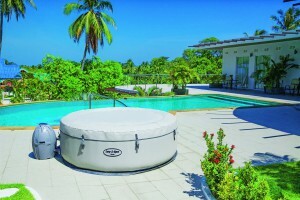 The Lay-Z-Spa Monaco can heat water up to a balmy 40 degrees Celsius, adding to the relaxing atmosphere it creates.. This tub normally also comes with equipment needed in its maintenance: Two filter cartridges, a chemical floater, a maintenance guide, and a setup DVD. This is a great choice for those who want a bit of it all, and aren’t afraid to pay a little extra to have it. Click here to read our full comprehensive view of the Monaco model.